Bajaj Pulsar 220F ABS: With the approaching April 2019 deadline, all two-wheeler companies have already started gaining momentum towards introducing anti-lock braking systems in their scooters and motorcycles (bikes). The Government of India has given them a specific date after which none of them will be able to sell a single product without ABS in the market. The new rule says that the two-wheelers below and up to 125cc will have to use CBS (combi braking system) and the vehicles above 125 cc need to have ABS installed on them. Considering this norm, every single two-wheeler company is trying their best to make it before the deadline. Keeping the same in mind, Bajaj is doing the same with its bikes. The Pulsar 220 is going to be the fourth bike of Bajaj to get the ABS as standard. The Pune-based motorcycle manufacturer already has Pulsar RS200, NS200, and NS160 with a single-channel ABS as standard in its lineup. A couple of days ago, the Pulsar 150 was spotted testing with the much-needed safety upgrade as a standard. 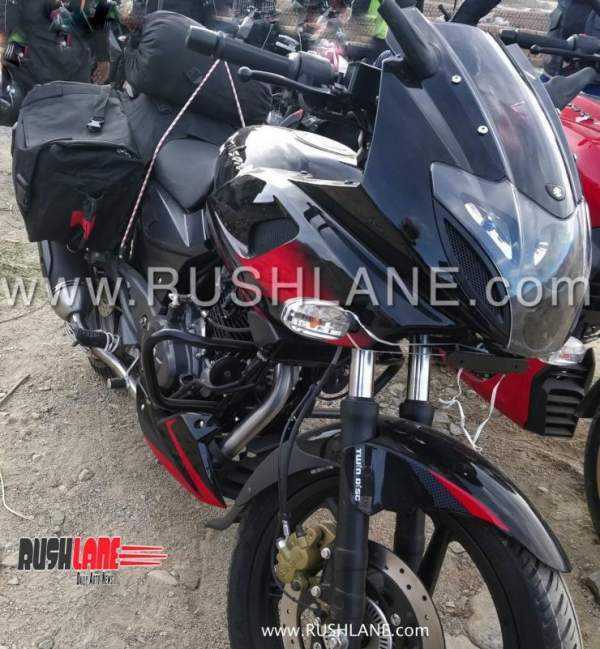 The spied shots of the Bajaj Pulsar 220F equipped with a single channel ABS upfront are making rounds on the internet. So, it seems that it would be launched soon in India. There are reports that the upcoming Bajaj bike will feature sports graphics and a completely blacked-out engine cowl. It can be seen in the following photograph clicked. Besides engine cowl and ABS, the other features of Pulsar 220F ABS are expected to be same as of the original model. It is powered by a 220cc single cylinder, air cooled engine that produces 20.93 PS at 8500 rpm and 18.55 Nm at 7000 rpm. It comes mated to a 5-speed transmission. The test subject had the same suspension setup as the current one in the market. At the front, it sports conventional telescopic forks and the back, it features twin gas-charged shockers. The bike has a single 260mm disk brake on the front wheel while a single 230mm disk brake on the rear wheel. The wheels are 17-inch five spoke alloys with a 90/90 section front tyre and 120/80 section on the rear wheel. The inclusion of the ABS will increase the Pulsar 220F ABS price by around Rs. 8000. As of now, the Bajaj Pulsar 220F sells at Rs. 96,448 (ex-showroom Delhi). So, the upcoming bike of Bajaj will retail at around Rs. 1,05,000 (ex-showroom Delhi). Now, it will compete with other bikes in this price segment having ABS as standard like TVS Apache RTR 200 4V ABS which costs around Rs 1,10,805, and has a dual-channel ABS with rear wheel lift-off protection too. It also rivals Yamaha FZ25 (Rs 1,19,335) and Hero Karizma ZMR (Rs 1,08,000, but both of these bikes don’t have ABS as of now. We expect Bajaj to optimize the powertrain for 2019 to get ready for the BS 6 norms. It will be better if it can get a 220cc oil-cooled engine and dual-channel ABS. As of now, it is the best selling bike in this segment and the non-ABS variant is the most affordable in this price segment. Stay tuned to TheReporterTimes for more bike news and updates. Next articleWhat is XXXXXX File Format: How To Open, Edit and Convert Files?